If no Solo button is on in the Session, then all Track monitors will be Enabled. LEFT Clicking the Track's Solo button will toggle it ON and OFF. If ON, the track is Enabled. Pressing any of the keyboard's 10 numeric keys – one or more at a time will toggle the numbered Tracks' Solo button(s). Each of the 10 numeric keys is mapped to a corresponding Track, counting from the top of the Revoice Pro window (top track=1, second track = 2 … etc to 10th track= 0). NOTE: If the tracks are re-arranged, the correspondence counting from the top track remains – i.e. the mapping to keys does not stay with a specific track – only the count from the top - which the updated number will show. Holding down Alt key and LEFT CLICKing a track's Solo button to turn it ON will Enable that track exclusively and toggle all other track's Playback enable controls OFF. Holding Alt and pressing a numeric key (1 to 0) to turn Solo ON for that track, will Disable all other Tracks. 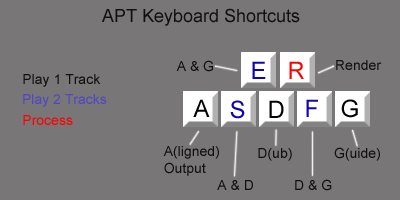 Process-dependent keyboard short-cuts (see APT Track Soloing, below) will Enable specific tracks of the selected process. Each APT process has two inputs and one output – and the user might wish to audition different combinations of these tracks, one or two at a time. To make auditioning the tracks of a process consistent – no matter which tracks the process inputs and outputs are in, the user must first ensure the process of interest is selected (i.e. the Input Process Control Blocks are GREEN. If they are not, click either the Guide or Dub Process Control Blocks to select the Process you wish to audition, and all the corresponding inputs and outputs to that specific process will turn GREEN. In that state - the keys shown in the picture above will Solo the tracks of the selected APT Process according to the diagram. For example, pressing A will play only the Output, and E will play both the Guide and the Output together. Additional Tracks not related to that Process can also be enabled to play with the Processed tracks by Left CLICKing the Track's Solo button ON or, if the Track is numbered, pressing the Track's number key to turn its Solo ON. For consistency, if a Doubler's Process Control Block or output is selected, pressing G will play the Doubler's input, pressing A will play the Doubler's Output, and E will play both the Doubler's Input and Output together. Similarly, if that track is Numbered, pressing CTRL plus the Track number will toggle Mute ON and OFF - and, as above, if Mute is ON, then the Track will be Disabled. Using the APT Keyboard Shortcuts will automatically Disable the Tracks that are not selected by the shortcut. Tracks can be grouped together so that monitoring controls affect all the tracks in a group. This is described in the separate section Groups.